Pricing Multi-Family commercial real estate in Louisiana is often difficult because the sector includes a wide range of types, from 100 year old plantation housing called shotgun doubles to low-rise garden style to high rise complexes. Each property type contains its own revenue supply and demand line and expense percentage, producing a variety of net operating incomes which affect how a property is priced. This article examines what the average prices are for Multi-Family across Louisiana and details the New Orleans market, and also explains how to price property based on its net operating income. 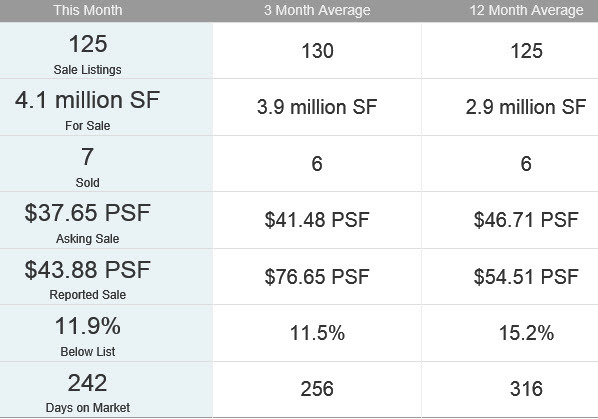 There is 4.7 million square feet of Multi-Family commercial real estate for sale in Louisiana, on the market for an average 242 days with an average sale price of $43.88 per square foot. The average price can be deceiving since it is biased by high dollar transaction which skew the averages. Of the 125 properties that are on the market, approximately 6 to 7 are sold each month, with the average sale price 11% below the list price. Pricing Multi-Family is a function of the net operating income, which is the revenue less expenses, with one exception. If the Multi-Family property is under 4 units, it can be converted into a single family house, and the price should be compared to existing single family homes with the same square footage that could compete with the same buyers. If the property is larger than 4 units, the property should be priced using either net operating income or average unit price. The chart below shows prices for New Orleans Multi-Family per unit (currently $69,000) have been higher than prices per unit across the state (currently $54,000) for the last 8 years. Multi-Family prices peaked in 2008 after a 50% increase, then plummeted with the recession, then rallied, fell and rallied again. 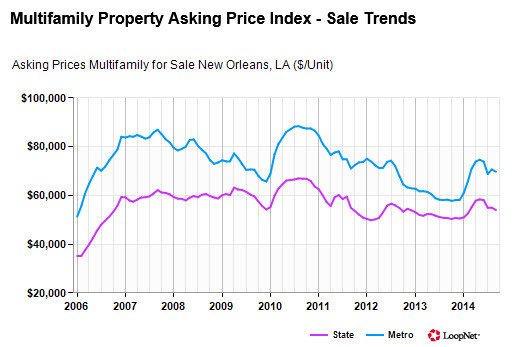 Year-to-date in 2014, prices are currently up 19.7% in New Orleans and up 6.6% across Louisiana. Whether you are investing in stocks or bonds or real estate or certificates of deposit, you do so to realize a greater future value after inflation. All of these investments have a value determined by two inputs: cash flow and appreciation. With stocks, you might get a dividend and hopefully a capital gain, and with CD’s you get income and no gain, just your principal back, and with bonds you get interest, or cash flow, and principal back at maturity and maybe a gain or loss if the value of the bond trades higher or lower before maturity. With commercial real estate, you get rental income and maybe appreciation when you sell. The smart way to value all of these investments is to calculate the present value of the future cash flows. That is, what you would pay today for the future income generated by the investment? If you expect to receive $100 one year from now, how much would you pay for that investment today? First, you have to know your opportunity cost, or how much interest you would earn on your next best opportunity. Let’s say you could earn 3% in a CD for one year, then comparing that to an alternative investment for one year that would pay $100, you would divide the $100 by one plus the interest rate (1 +3%), or 1.03, which is the same as $100/1.03 which equals $97.087. Therefore, you would pay $97.087 today for $100 in one year. You start with the calculation of the Net Operating Income, which is Gross Income less Operating Expenses. Gross Income is the income stream generated by the operation of the property, independent of external factors such as financing and income taxes. It includes both rental income and other income such as parking fees, laundry and vending receipts. 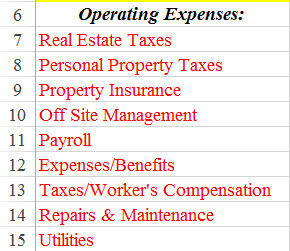 Operating Expenses are costs incurred during the operation and maintenance of a property. They include maintenance and repairs but not long term capital expenses, as well as insurance, accounting, permits, advertising, management fees, utilities, supplies, and property taxes. Smart investors will add in management fees on smaller properties that are managed by the owner for free. The following are not operating expenses: principal and interest, capital expenditures, depreciation, income taxes, and amortization of loan points. The result is Net Operating Income which is divided by the Cap Rate to determine the price. What is the average for Multi-Family Net Operating Income? 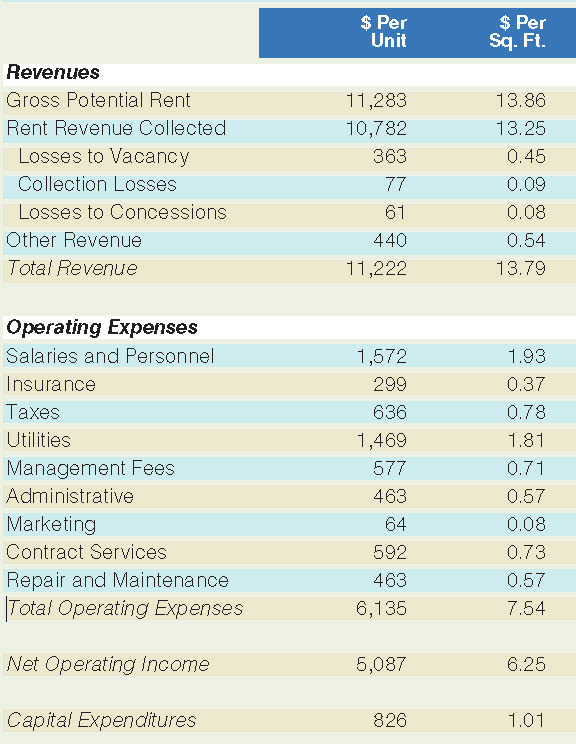 The National Apartment Association completes a survey each year to determine the average revenues and expenses, as shown in the table below. The first column shows the figures in dollars per unit and the second column shows the same in dollars per square feet. 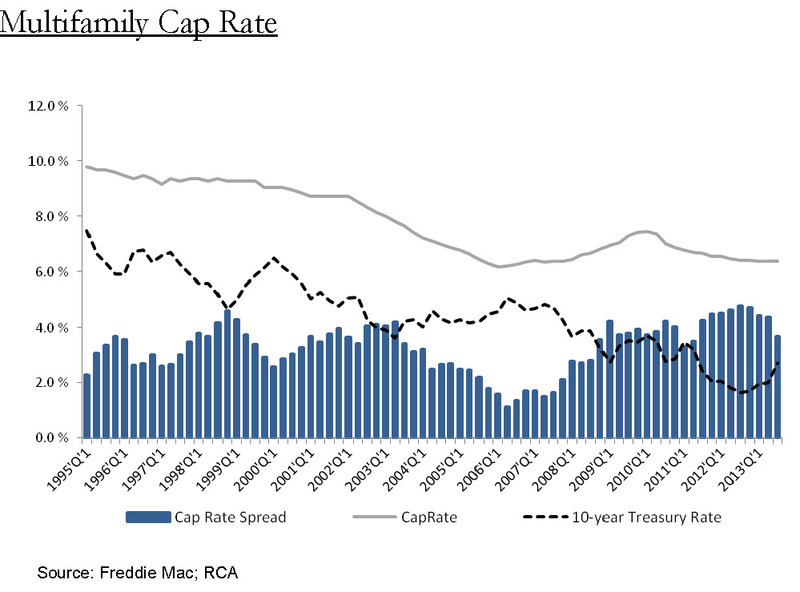 According to research from the largest financing institution, Freddie Mac, the Multi-Family sector has average national Cap Rates of 6.40%, and has been trending down since 1995 from its peak at 10%. Note the Cap Rate solid line tracks the 10 year Treasury Rate dotted line. In summary, using the tables above to illustrate how to price Multi-Family, the national average Net Operating Income is $5,087 per unit, divided by the national average Cap Rate of 6.40% results in an average per unit price for Multi-Family of $79,484. You can get Net Operating Income worksheets at the Louisiana chapter of CCIM website. For a free valuation on Multi-Family property, contact Louisiana Commercial Realty, LLC, at 504-289-8172.